Snowboard boots are one of the most important parts of your snowboard equipment. A properly seated snowboard shoe is therefore of great importance. They shouldn't be too tight because then you will soon get bothered by your feet. Because of this you don't get through the day because they are going to burn. If they are too big, you can't convert your movement sufficiently to your board. Even then your foot will hurt. A snowboard shoe consists of two different parts: the outer shell and the inner shoe (also called the liner). The outer shell of the snowboard shoe is important when it comes to the handling characteristics of the shoe. The different driving characteristics can be roughly divided into the categories freestyle (soft), all-mountain (medium), freeride (medium-stiff) and race (stiff). 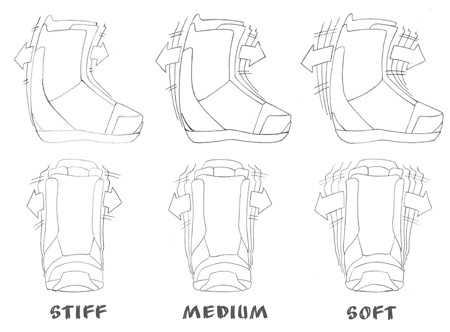 The stiffness stands for the flexibility of the snowboard shoe. The flex of the snowboard boots are both forward and sideways and therefore determine the force between the rider and the snowboard. The more flexible the boot, the more agile you are on your snowboard. The flexibility lies in the material and construction of the shoe. Fortunately, you don't have to do anything more with frozen fingers trying to snake your laces. A number of different fastening systems have been added that make putting on a snowboard shoe an egg. First of all, you have the BOA closure. The BOA closure consists of a button that is connected to several steel cables. With the knob, the cables can be looser and tighter adjusted and secured. With this system it is possible to adjust the upper and lower parts of the shoe separately. Secondly, there is the Speed Zone lacing system. Here the traditional lace has been used, but without a snare job. With this system you pull the laces on it you put them in clamps. Again, it is possible to adjust the lower and upper parts of the shoe separately. Buy the snowboard shoes because they're in good condition. Pay particular attention to wearing comfort and not to size. Make sure you have the possibility to fit different snowboard shoes. Always fit both snowboard boots with your own snowboard socks. Many people's feet differ in size. The snowboard boots should be tight but certainly not pinched. It is also best to let your toes hit the extreme tip of the shoe. Make sure that the heel section fits correctly and that the sole has sufficient grip. The heel must provide sufficient support, so it is important that you don't loose from the shoe. If you already have bindings, only the shoes in the bindings. See if they fit with the size bindings and if your feet stay in place while you move a bit. You should not feel any pain or notice that a place is under pressure. Have you become a little wiser and would you like to watch shoes? Check out our snowboard boots from all top brands.